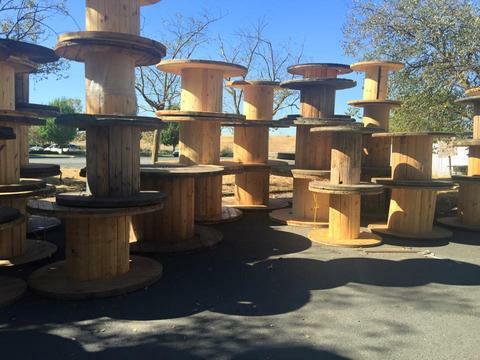 Cable Spool furniture done right. 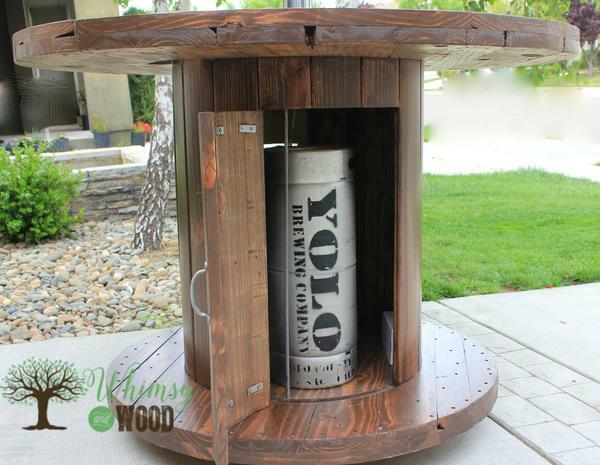 This cable spool is now a high end patio bar with a working Kegerator & wine storage. Cable spool patio set may sound like you rolled some hunk of junk home and put some chairs around it. Not it this case! 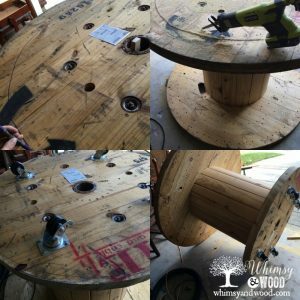 When I started on this project I knew I wanted to turn this giant cable spool into an industrial patio table. It can be hard to see a cable spool anything other than industrial. Industrial is so hot in home decor right now. I wanted this set to have a high-end trend setting look. This post does include Affiliate links to tools and items used in this project. This cable spool was huge! The kind of huge that required a forklift to put it into the back of my truck & then dented my wheel wells. 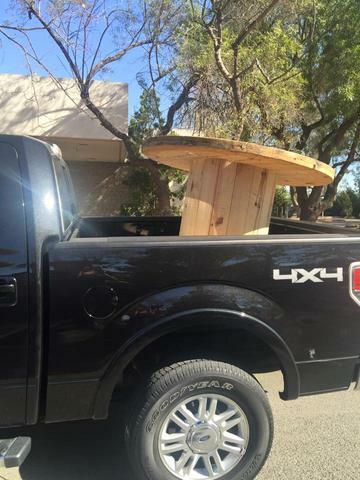 I suppose that is what trucks are for. The spool had a 55″ diameter top & bottom. 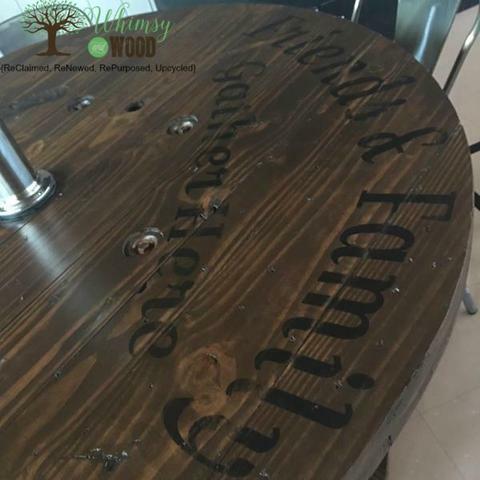 Perfect for a family sized outdoor table! The size was great for the top, but I needed to cut down on the bottom half. 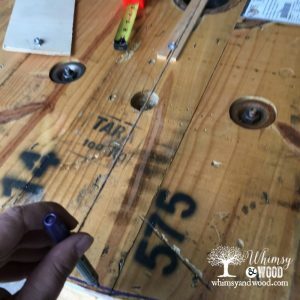 I flipped the cable spool onto its top & marked a circle for where I wanted the new edge to be. Since the center of the spool is a giant hole. I temporarily nailed a wood block over it the void. Next, I measured from edge to edge of the spool and found the center. I marked it on the wood piece that I had nailed in place. Using a string as a trammel I tied one end to the nail, and one end to a marker and marked off my new circle. This would be my new edge once cut. You could also use a straight wood block to do this by clamping a pencil to one end and a screw to the other. The string gave a little more flex than I wanted. There are a few options that would work for this trim down. I used my Ryobi Reciprocating saw. You could also use a jigsaw & have a little less sanding afterward. I did not have an appropriate blade to use the jigsaw and didn’t want to run to the hardware store. Next, I used my belt sander to go around the table and even out the cuts. While the cable spool was still upside down the locking casters were screwed into place. Make sure you choose casters with the correct weight allowable for your project. Also, get casters that lock in place. When done, get some help and flip the cable spool over. When the cable spool was back to upright, I marked and cut out a window to hold my metal wine storage rack. For this part, I did not need the wood that was being removed. I drilled a hole in the pine slats inside of my cut line. I only drilled into the area that would soon be waste cut out of the project & no longer needed. The cut will depend on what size your wine storage will be. 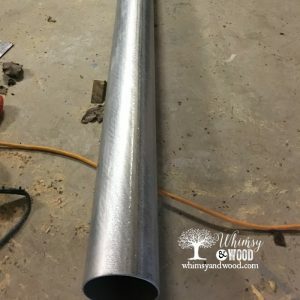 Our metal wine storage rack was 10 feet EMT conduit pipe section cut into 10 equal sections. (EMT looks like a thin pipe with a 4″ inside diameter) I then had them stacked 2 wide and 5 high. Our friend welded them together to make the wine rack insert. We added a metal strip to the back of the wine rack to keep the bottles from falling out the back side. Adding the Kegerator meant needing a place to store the keg. On the side opposite the wine storage, I cut out 3 boards a little taller than my pony keg. Boards were secured to each other with mending strips to make a door. I added Gate hinges and a gate lock to help it function as a swinging door. 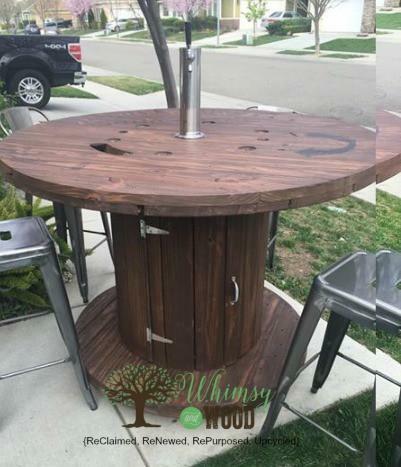 Can you believe the pieces to make this cable spool into a kegerator already existed? A little bit of searching on Amazon turned up some great keg conversion products. This is the draft tower with lines and gauges that I chose for the beer and the CO2 tank. In planning, we had toyed with ideas for an ice bath to keep the keg icy cold. Then, Google search magic happened. I found a system that had a re-freezable ice blanket and a neoprene insulator sleeve. The ice blanket wraps around the keg and the sleeve goes over it. This set up is for an event and will keep it cold for many hours. Thank you, Yolo Brew, for the great beer to try out our creation! This is one of my favorite Upcycles or builds yet. It really came together well. Let me know what you think by commenting below. If you have done something awesome with a cable spool I would love to hear about it! Thank you!I swear it was like the stars aligned to bring this one together. Very fun project. I am trying to figure out how to cut the door into the bottom area for the tank so it will match up opnce the hinges are put on it. Am I thinking too much into this, can you email me some tips. Garrett, I left a full board to attach the gate hinges to. I felt good about the strength of the finished piece that way. The pieces above the door are then put back together and mounted in for aesthetics. I hope that helps.